This is quite an interesting relatively early book on card moves, tricks and cons. It was published in 1877. 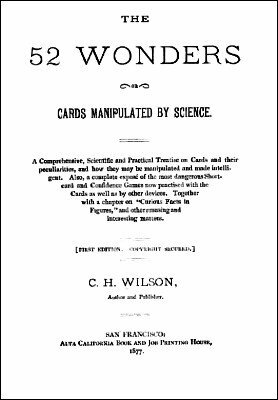 Some believe that the author C. H. Wilson could be the elusive Erdnase, the author of The Expert at the Card Table , because the S.W.E. Shift is explained in The 52 Wonders . 1st edition 1877, original 32 pages, PDF 23 pages.